I’m not entirely sure why I fell in love with Casablanca but something about the city certainly resonated with me. Arriving at Casa Voyageurs train station it was an easy ride on the Casa Tram to where we were staying near the Boulevard de Paris. The center of the city was very walkable and had a European feel to it, especially because of the French influence. Whilst it may not feature on the wish list for many people traveling to Morocco, Casablanca really has a lot going for it. There is some beautiful architecture, the beach and we found some great food. 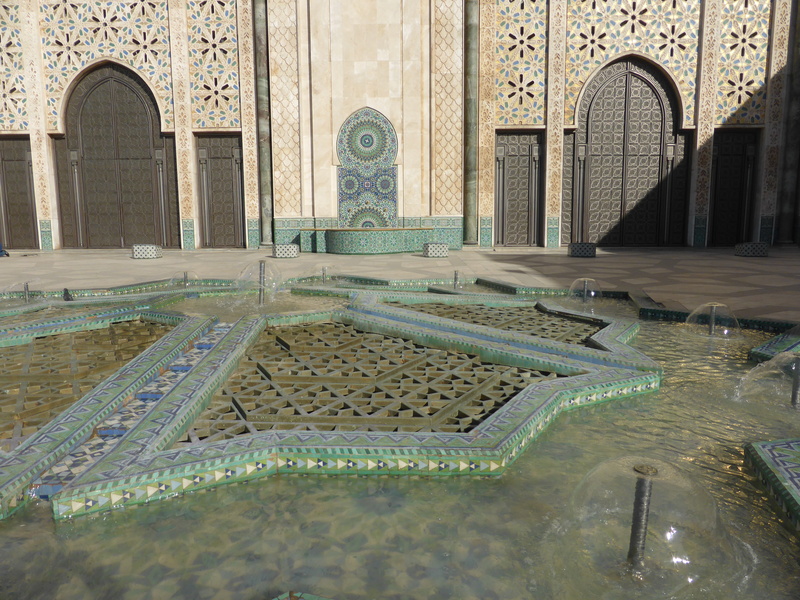 The number one attraction though is the Hassan II Mosque. Built by the late King Hassan II and designed by the French architect Michel Pinseau, it is a spectacular building made all the more spectacular by its location on the edge of the Atlantic. 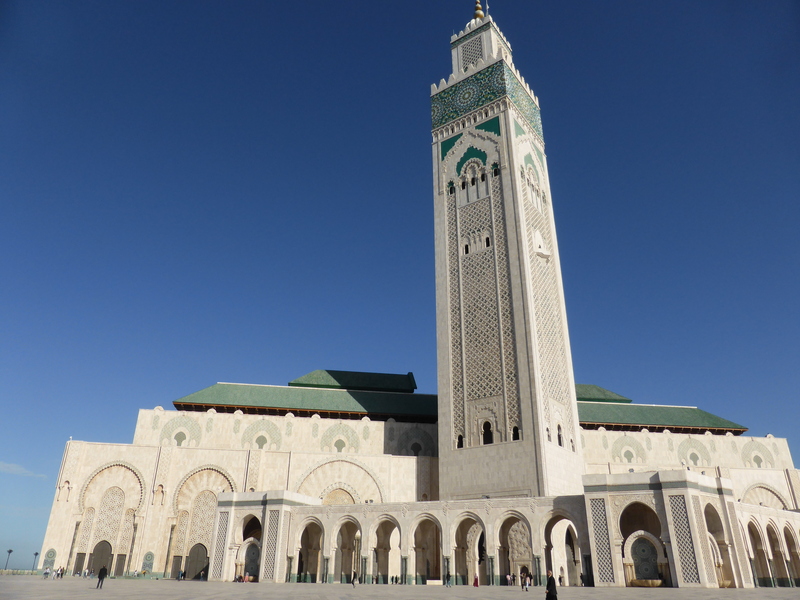 The minaret is apparently the tallest structure in Morocco and the mosque itself is the third largest in the world. 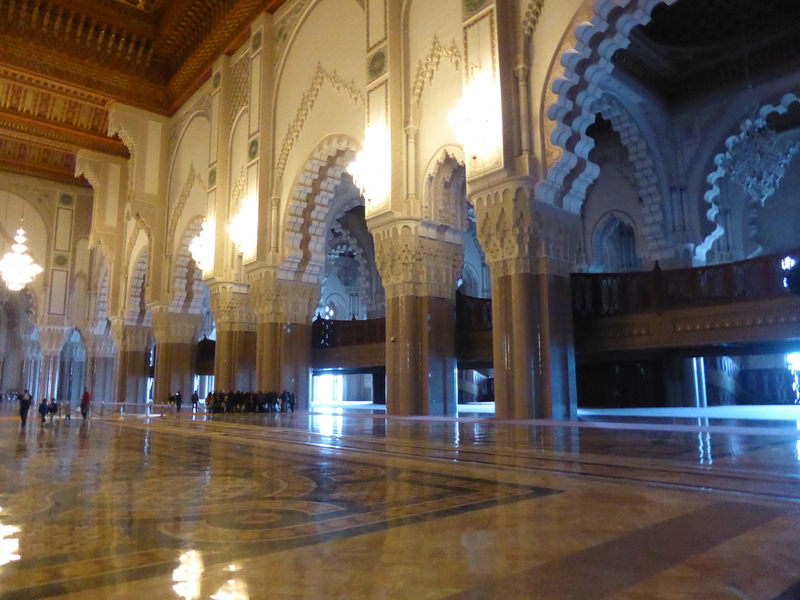 Unlike most mosques in Morocco, the Hassan II Mosque is open to non-Muslims so we paid 120dh for a tour. The prayer hall accommodates 25,000 worshippers and so is truly immense. The mosque was built by master craftsmen using materials from Morocco (as well as some Murano glass from Italy). I would really recommend visiting because it is simply breathtaking. We walked along the coast from the Hassan II Mosque to Aïn Diab to visit the beach. It was quite a walk but that was probably a good thing considering the amount of food we ate in Casablanca. We also visited the Morocco Mall which was seriously luxurious. It has an aquarium and you can catch an glass elevator right up the center and find yourself surrounded by fish and also part of the attraction for people in the mall. When it came to food, the Lonely Planet did not let us down. 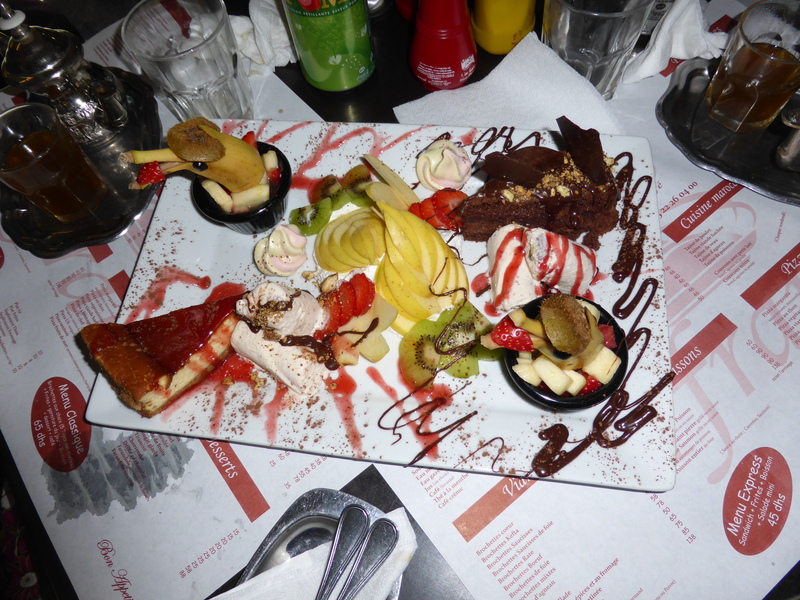 We ate at Ifrane (which provided us with the beautiful dessert above), La Bodega (why wouldn’t you eat tapas in Morocco?) and breakfast at La Sqala. 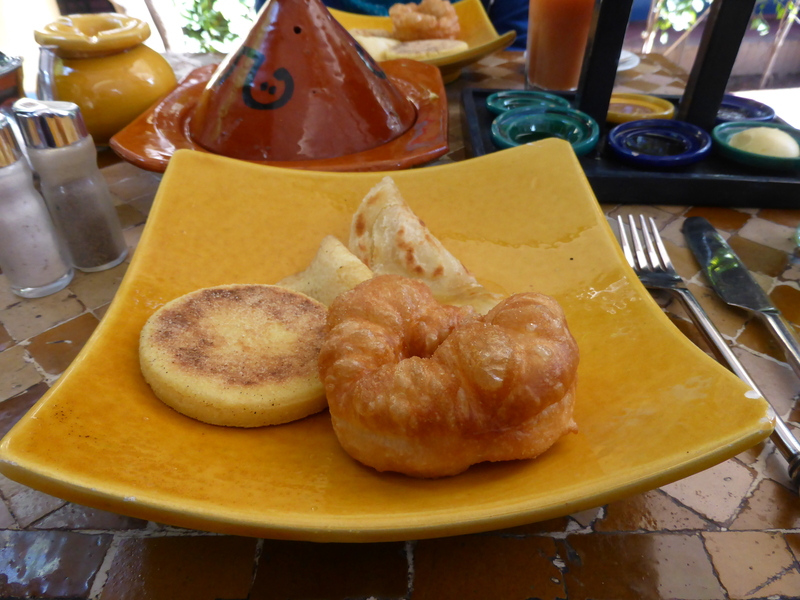 Now at this point I think that I should mention that I would go back to Casablanca simply to eat breakfast at La Sqala. The restaurant has a beautiful shady courtyard and a menu full of tempting things. We opted for the F’tor Sqala breakfast which was 155dh for two people and had four different kinds of pancakes! I loved Casablanca from the moment we arrived but I confess that it is the food that I remember most fondly. The city may not be what you think of as typically Moroccan but it is a beautiful city nonetheless. I hope I do get to go back one day. Au revoir, Casa. Wow … sounds absolutely wonderful especially the food and you know how I like to eat!! I will have to put Morocco on my list of places to visit. Keep up the good work … there is life after the office! !